Apple trees are a semi-hardwood that is found throughout most of the world’s temperate climates. Apple Wood Chips are prized in the culinary world for their pleasant scent and the sweet smoke that comes with smoking using them. The flavor from smoking with Apple Wood Chips is very mild, another benefit to using these chips in smoking. The foods that benefit most from Apple Wood smoke are seafood, fish, and shellfish that benefit from the sweet treatment, like salmon. It is also fantastic with pork chops, tenderloin, and even veal. 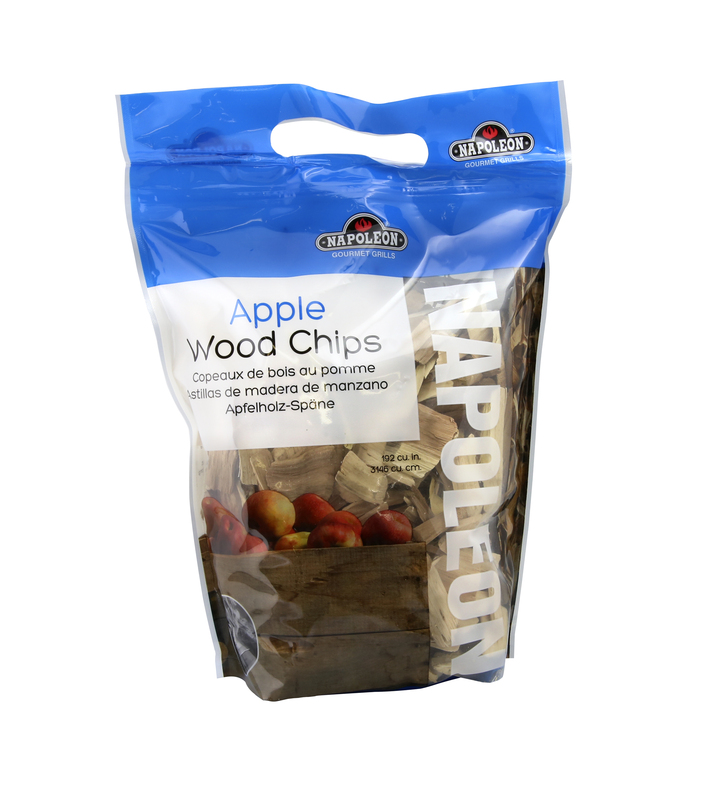 Apple Wood Chips are great for smoking fruits and vegetables too. When using Apple Wood Chips, soak them for at least 30 minutes in water, apple juice, ale, wine or cider, chardonnay, pinot noir or even pineapple juice. Remove the Apple Wood Chips from the soaking liquid and place them into the Napoleon Smoker Pipe, then place the pipe onto the sear plates of a gas grill. Conversely, you could place the soaked Apple Wood Chips into the smoker tray, integrated directly into the Napoleon Prestige PRO Series PRO665RSIB Gas Grill. When the chips begin smoking, place your food directly on the grill and close the lid, trapping the sweet smoke in with the food. Remember to keep the lid closed and only check the food when necessary to get the most out of the Apple Wood Chip smoke flavor.